We saw the Chinese swoop in and grab a bargain from the increasingly isolated Russian dictator. Desperate to show the oligarchs that he’s still the man in charge, the Russian dictator agreed to develop gas reserves for sale to China that, by all reports, was a steal for the Middle Kingdom. China like Russia has competing sides that must be placated by leadership. This time the hard liners in the Red Army would have been the ones celebrating. But that celebration my not be a long one. China having finally if not officially conceded that Mao and Marx were equally wrong about economics continues to act like a Stalinist state. The Chinese Red Army, that still holds much of the power, would have been thrilled seeing China’s long term goal of being the dominant world ruler advanced by doing anything to show they can stand up to the old adversary and ‘Paper Tiger,’ the United States. But in a nation that has enjoyed unprecedented trade surpluses with the U.S.,the economists who have to keep the Chinese economy in balance, must be getting a bit nervous. First, U.S. politics will react to the Russia-China merger as evidence that both countries must be reigned in. The more extreme elements of the GOP the so-called ‘Neo-Cons” will use it as another excuse to build an even more powerful U.S. military. This will put economic pressure on both China and Russia that will try to keep up. The simple fact is that the rejection of both Chinese and Russian exchange students that will soon commence will slow these nations’ ability to transfer technology from the U.S. to their arms industry. Second, now that China can be perceived as aligned with a dangerous and murderous dictator, U.S. politicians in both parties will now be free to impose sanctions on China for its currency manipulation and its trade imbalance. The first moves will seem modest but will signal to external capital markets that the Chinese party is coming to an end. Third, the brutal and at times unbalanced persona of the Russian dictator will give two divergent U.S. political forces common ground. The militarists in the GOP for the fist time will find an issue that they and U.S. left can agree on. In the end the U.S. will adopt trade policies that are advanced as “bringing our jobs home.” China, that now makes the large share of U.S. consumer goods will have to focus their efforts in the Russian market as the U.S. dries up. In the absence of U.S. markets, China’s Communist leadership will have to find a plan continue to stand as the great force in development of a better life for the Chinese people selling TV’s to the Russian people who because their wealth has been stolen by a class of oligarchs remain poor, earning an average of $9,000 per year. In the end, China political forces will erupt, as they have historically erupted when the Emperor fails. China will return to the status of a colony dominated by Russia that can forcing the Chinese to pay for the new opium supplied by their former colonial master in the form of Russian natural gas while Japan continues to make products welcome in the U.S. and laughs all the way to the bank. 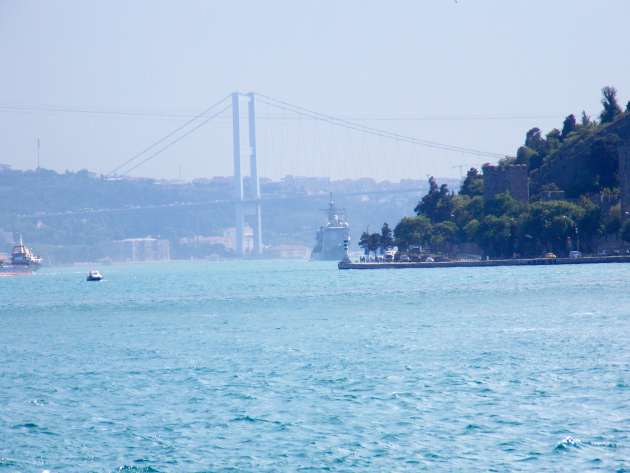 Ticonderoga class cruiser CG-72 USS Vella Gulf, making a northbound passage through Bosphorus. 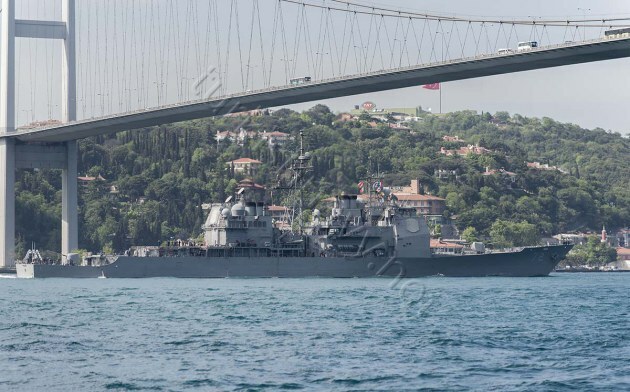 Ticonderoga class cruiser CG-72 USS Vella Gulf passing through Bosphorus. Photo: Yörük Işık. Used with permission. 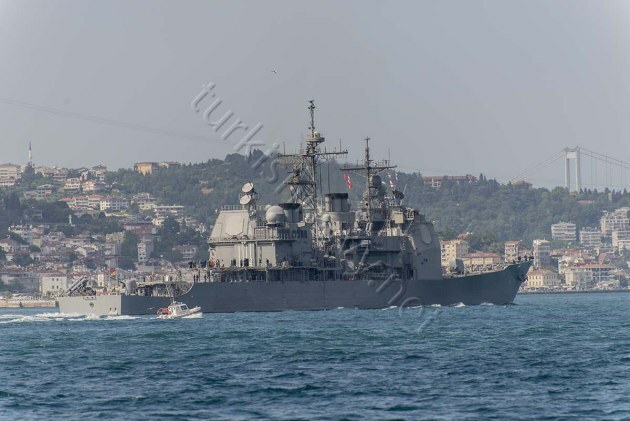 Today US Navy send the Ticonderoga class cruiser CG-72 USS Vella Gulf to the Black Sea. 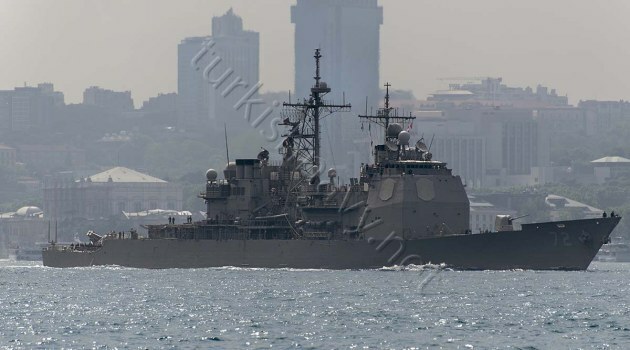 She is the 5th US navy ship That is deployed to the Black Sea. 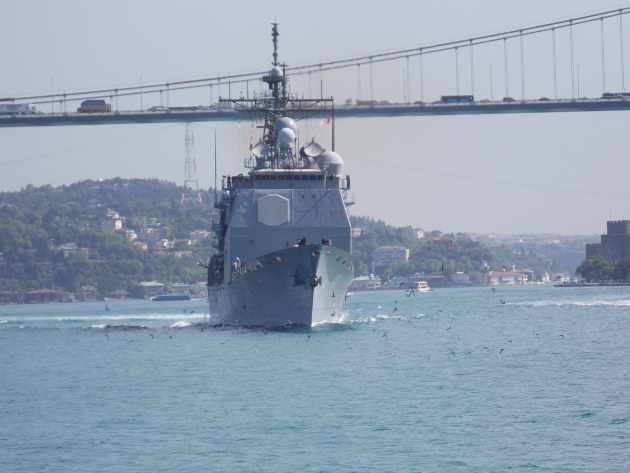 She can stay in the Black Sea till 14 June 2014. The little Russian dictator forgot the first three rules of world conquest: (1) Have an Army, (2) Have a Navy and (3) Have an Air Force. It’s time to stop pretending that today’s Russia is anything but an aggressive but militarily weak regional power. President Obama realizes it and that fact should not be lost on the Russian high command. The U.S. armed forces are far more powerful and far better prepared for war than Russia and China combined. Separately, the Russian Air Force could be destroyed in a matter of days. The Russian Fleet is a rusting joke. Its Army is a amateurish band of recent high school graduates operating obsolete equipment. If the EU is going to accept the imposition of a military backed power running Europe it should and will be the U.S. not Russia. Americans are sick of dying for Europe’s mistakes. The U.S. should stop acting solely to placate the domestic politics of European countries. If Germany or France want to go it alone the U.S. should work deals with Poland, Romania, Bulgaria and the Baltic nations to forward deploy sufficient air force to inflict a crushing blow to the Russian Air Force. 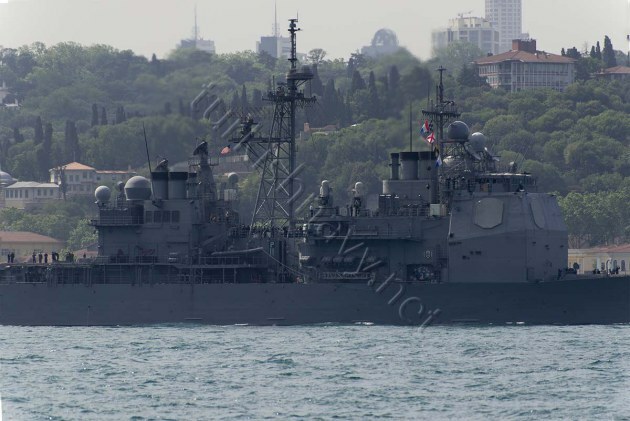 With the imminent installation of Aegis Ashore anti-missile technology, Russia’s intermediate missiles are close to useless. We should pass the costs of this defense on to Europe in the form of import tariffs. We should also insure that U.S. natural gas and oil will fill in any shortage if Russia commits economic suicide and cuts off oil and gas sales. If Russia wants to pretend it is the Soviet Union, then the next time a Bear Bomber approaches the U.S. should have advised Russia that its actions are acts of war and any such air craft should be ordered to leave and then shot down. If Russia scrambles the U.S. should take it as an invitation to annihilate the Russian air force. Then we should turn to the sea and sink the pathetic Russian fleet. Every ship, submarine and destroy every dry dock. Russia can then ask the U.S. if it’s okay to put a boat in the ocean. This may sound extreme but, mark my words, if Europe does not convince Russia to control its little dictator, the next U.S. president will run and win on this platform. The better course is to crush the Russian economy now, wall Russia up and keep the civilized world free from Russian aggression. When the little dictator has been removed, Russia can apply for a membership in the civilized world. Until then, wall it up.